In English-speaking countries with large immigrant populations, it is also variously known as kalonji in Hindi/Urdu कलौंजी kalauṃjī or كلونجى/कलोंजी kaloṃjī) or mangrail (Hindi मंगरैल maṃgarail), ketzakh (Hebrew קצח), chernushka (Russian), çörek otu (Turkish), habbat al-barakah (Arabic حبه البركة ḥabbat al-barakah, seed of blessing), siyah daneh (Persian سیاه‌دانه siyâh dâne), karim jeerakam in Malayalam. Easton's Bible Dictionary clarifies that the Hebrew word for Black Cumin, "Ketsha" refers to "without doubt the Nigella Sativa", a small annual of the order Ranunculaceae which grows wild in the Mediterranean Countries. However although many people and cultures knew of black seed it was not scientifically researched until about forty years ago. Since then more than 200 studies have been conducted in the Universities all over the world. One such study conducted at the Munich Institute for Research on Newer Therapeutic Methods [Münchner Institut zur Erforschung neuer Therapieverfahren] has confirmed by means of the most modern analytic methods that Black Seed oil contains over 100 active health-promoting substances and displays superior clinical effectiveness as a nutritional supplement. Among the many amazing discoveries researchers have found, is that the Black Seeds are superior to almost every other natural remedy when used for autoimmune disorders; conditions in which patients suffer greatly because their own systems attack their bodies. Black Seed, especially when combined with Garlic, is regarded as a harmonizer of the imbalance which allows immune cells to destroy healthy cells. The technical language to describe this property is "Immunomodulatory Action." The difference between Black Seed and interferon is that there are no known side effects with Black Seed when administered in normal dosages. All in all Black Seed has been known and used throughout many cultures for over two thousand years. Ibnul Qaiyum (may Allah have mercy upon him) said, "It has immense benefits and his statement that it is a cure for every disease except death is like the statement of Allah." 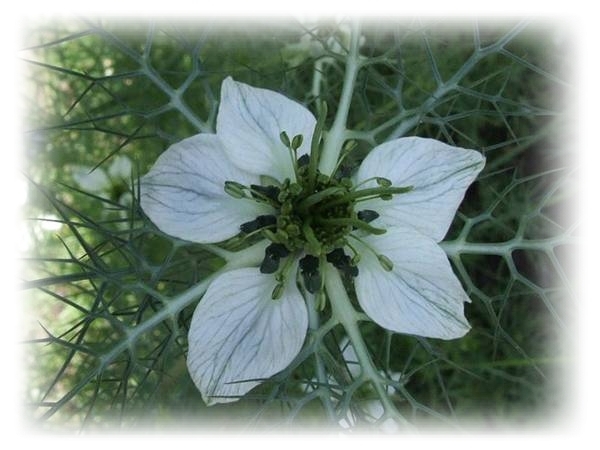 Nigella Sativa are known by many names for example, Black Seed or Black Cumin. Habbat ul barakah in Arabic countries (the Blessed Seed) due to the saying of the Holy Prophet (saw) and habbat as-sawda. It is referred to as Schwarzkummel in Germany and Corek Otu in Turkey. It is often named Black Onion Seed because of its similarity to onion seed in appearance but they share no relation to each other. Dear reader please note the hadith makes no mention of the word oil. The Prophet (saw) never used black seed oil! This is an important distinction as many people today are selling the oil and quoting the hadith as if it refers to the oil, which is causing confusion amongst people. In the hadith the Prophet (saw) specifies a dose of 7 seeds in each nostril for infection gives us an indication of the dose and the fact it is the seeds and not the oil. We are trying to emphasise the hadith and its meaning. Isn't the oil is just the same as the seeds as it contains the same active ingredients? On the face of it this may sound like a good argument but apart from going against the hadith it is also a scientifically flawed argument. No one would compare eating olives to consuming olive oil, or the derivative of a product to the whole product. The fact that the product is derived should be enough for a person to understand something is missing. To make it even simpler to understand how about comparing eating whole coconut to coconut oil or even whole fish to fish oil. What does the hadith "In it is a cure for everything except death" mean? There are a number of hadith pertaining to Black Seed and Hijama etc that state: "In it is a cure for everything except death." So why do these remedies not cure cancer, diabetes and all the illnesses in the world? This is a common question for most people but what we should know is that if something does not seem right in the Qur'an and Sunnah, it's not the Qur'an or Sunnah but usually our understanding of it. I would remind our readers to be careful when things are translated from Arabic to another language, in this case English and always try to return to the original Arabic to resolve any issues. In regards to these hadith the Prophet (saw) did not say "Al shifa" rather the Arabic word 'Shifa' (cure) came without the definite article which means that it is an indefinite word that covers most cures. This means that the Black Seed contains a benefit that contributes to the cure of every disease. However some people may misunderstand the translation and end up confusing themselves as well as others. From a medical point of view, these remedies contribute to the total cure - and not that they are the total cure themselves alone. For example Black Seed strengthens the immune system and so if the immune system is strengthened so will your bodies resilience against disease. Similarly, Hijama removes chemical impurities from the body and if this is done on a regular basis as recommended in the Sunnah, then it greatly reduces the likelihood of diseases gaining a permanent hold in your body. So the correct understanding of the hadith is that these remedies contain a benefit that contribute to the cure (shifa) of every disease. So is Black Seed oil useless? We would advise on balance there have been medical studies done using the oil and some scholars have indicated the use of the oil as part of specific remedies. So if one wants to use the oil form then they should follow the guidance from those studies as they have knowledge regarding the correct dosage for the conditions treated with the oil and can provide the statistics for the level of success. However the oil tends to be a very strong product and anyone who has tasted it can attest that it has a sharp and bitter taste, and for many people the oil causes stomach upsets etc, so we advise it should not be consumed on a long term basis without a compelling medical basis for doing so. For thousands of years, people around the world have recognized the tremendous healing properties of this Legendary Herb: "Nigella Sativa or Black Seed." 4. Activation of the immune system. The Black Seed contains a non-starch Polysaccharide component which is a useful source of dietary fiber. It is rich in fatty acids, particularly the unsaturated and essential fatty acids (Linoleic and Linoleic Acid). Essential fatty acids cannot be manufactured by the body alone, and therefore we acquire these from food. The Black Seed is also a source of Calcium, Iron, Sodium, and Potassium. Required only in small amounts by the body, these elements' main function is to act as essential co-factors in various enzyme functions. Using an active principle of fatty acids derived from Black Seed, studies with Swiss Albino Mice showed that this active principle could completely inhibit the development of a common type of cancer cells called Ehrlich ascites carcinoma (EAC). A second common type of cancer cells, Dalton's lymphoma ascites (DLA) cells were also used. Mice which had received the EAC cells and Black Seed remained normal without any tumor formation, illustrating that the active principle was 100% effective in preventing EAC tumor development. The Black Seed Oil proved to be more effective against many strains of bacteria, including those known to be highly resistant to drugs: V. Cholera, E. Coli (a common infectious agent found in undercooked meats), and all strains of Shigella spp., except Shigella Dysentriae. Most strains of Shigella have been shown to rapidly become resistant to commonly used antibiotics and chemotheraputic agents. A study by Agarwhal (1979) showed that Black Seed Oil increases the milk output of breastfeeding mothers. A literature search by the University of Potchefstroom (1989), including biological abstracts, revealed that Black Seed's capacity to increase the milk flow of nursing mothers could be attributed to a combination of lipid portion and hormonal structures found in the Black Seed.